For the plan section we will set the width (this width value will be also used in the next sections), the height, add some padding and rounded corners using the “border-radius” property. Then we will add the typography styles (font family, size, line height, etc.) for the plan title and small description. We also have two different color schemes, green and orange. For each color scheme we will set a different color, text-shadow and background image. The price section is the most difficult one because we have a lot of details here. To start we will set the same width value as the plan section, add a light CSS3 gradient, some typography styles, etc. 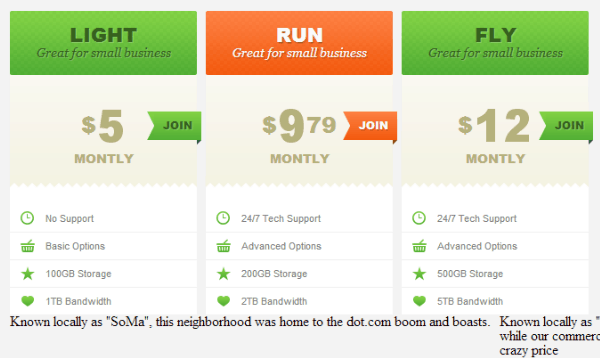 For the “Join” button we will position it 41px from the top and -5px from the right, add the paddings, font size, etc. As we did on the plan section we also need to set different colors and gradients for the green and orange color schemes. To add the “two triangles” and the “small arrow” to make the button look like a “flag” we will use the :before and :after pseudo-selectors. This two selectors allows us to insert content before and after the element, this way we don’t need to add two extra tags in the html. The small arrow at the right of the button will be added using a smart border technique. By combining all the borders with different colors for each one, we can create custom shapes, like triangles, for more info about this technique you can take a look at this website. We will start with the “stripe” at the top of this section, we will add it using the :before selector. Then we will set the width (notice that here the width is not 210px because we have some left padding), the top border and some typography styles. For the icons we have a custom class for each one and we only need to position the background image for each class. The description section is the simplest, only text. As usual we will set the width, paddings, background color, align the text to the center, etc. This is the end of our table column and we will add a shadow and rounded corners using CSS3. For the last section of our table, the “floating” text (where you can add a custom description to make a column stand out), we will add a custom font, you can find this font on fontsquirrel and we will add it using @font-face. Then we will position this section, add the text styling and the orange arrow at the top. As usual internet explorer has some small differences on the CSS rendering, to fix them I’ve created a new file that will be loaded only in IE9, IE8 and IE7. To load this file only in this browsers we will use conditional comments. This is the end of this tutorial. I hope you find it useful and have learned something new from it. 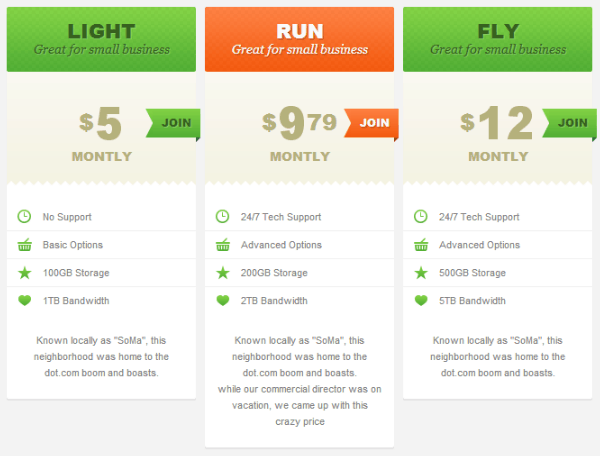 Feel free to use this pricing tables on your next project or personal website. Don’t forget to follow us for more articles, tutorials and quality resources. Enjoy! Using tables in a CSS3 tutorial? Now I’ve seen it all. What’s the problem? What I see is that you don’t know what your talking about. You, sir, did not get it: Tables for tabular content are perfectly fine. Tables for layout purposes are evil. @Jay Fi tables are fairly accepted for tabular data, like this one. In any case, the concepts still apply if you want to turn these tables in a couple of div’s with inner lists (div > ul). For me, that last approach seems more semantically correct. Tables may not be the best idea if your designing for all devices and need each column to sit vertically for mobile phones / cell phones – rather than across the screen. Yeah, I’ve first coded it using ul and li. But then I’ve looked at it and decided to built it using tables (because there would be someone that would say “why are you using unordered lists if this is a table?”). Also this was not build to be responsive. fab tutorial, simply love the effects on the header. but I wouldn’t use tables, like most have pointed out themselves. but the result look awsome – so tables aren’t such a bad thing after all. Thanks Brian. For those who don’t like tables, can easily make this tables using (ul and li). 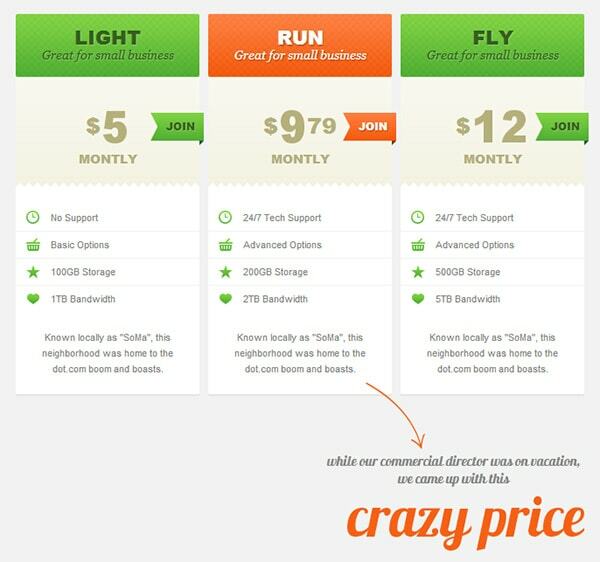 Your pricing table looks nice, but I would’t build it using divs. * please add margin: 0 to h2, because not everyone uses reset.css. Nice, thank you for the code. love your work.